Sinus of Valsalva aneurysm arises mainly from a congenital defect of the aortic media or may follow injury, endocarditis, syphilis, Behcet's disease, and Marfan syndrome., It comprises up to 3.5% of all congenital cardiac anomalies., It is more prevalent in people from Asian descent. The aneurysms originate predominantly from the right coronary sinus (67-85%). Coexisting cardiac lesions, such as a ventricular septal defect (VSD) or aortic valve regurgitation (AR), may both be present in about 30%–40% of patients., VSD is more common in Asian population (52%). The aneurysm may lead to myocardial ischemia and/or conduction disturbances due to compression of a coronary artery or the conduction system, respectively. An aneurysm of the sinus of Valsalva ruptures in 35%, leading to acute symptoms in one-fourth of the patients. A ruptured sinus of Valsalva (RSOV) aneurysm is associated with a severe left-to-right shunt when it communicates with the right-sided heart chambers. If timely intervention is not done, it leads to the deterioration of heart function. Symptoms associated with rupture are shortness of breath, chest pain, and fatigue., The severity of symptoms depends on the degree of the shunt, the presence of associated lesions, and age at presentation. Most aneurysms rupture into the right-sided heart chambers and rarely into the left-sided heart chambers and pulmonary artery. In patients with untreated ruptured sinus of Valsalva aneurysm (SVA), a mean survival period of 1-2 years has been documented by Moustafa et al. The operative results for SVA repair has been excellent, with long-term survival rates being 93% at 20 years. Since surgical treatment of SVA is safe and effective, ruptured SVA or unruptured SVA with VSD and/or AR should be repaired surgically as early as possible. We hypothesized that the presentation with heart failure (HF) and the presence of associated lesions will have an impact on the postoperative left ventricular (LV) function and the outcome. Eighty-seven patients of RSOV coming for surgical closure between 2001 and 2016 at Sri Sathya Sai Institute of higher medical sciences were reviewed retrospectively. Age of presentation, presentation with HF, i.e. symptoms of congestive HF, association of coexisting heart lesions, postoperative ventricular function, the Intensive Care Unit (ICU) stay, and complications in the recovery were assessed. Postoperative LV dysfunction was defined as ejection fraction <50%. It was assessed by transthoracic echocardiography before discharge; this was done to rule out cardiopulmonary bypass-related LV dysfunction. Prolonged ICU stay was defined as stay more than 48 h in ICU. Statistical analysis was done to see if the coexisting lesions and preoperative HF were associated with postoperative LV dysfunction. Other postoperative outcomes were clinically not significant. 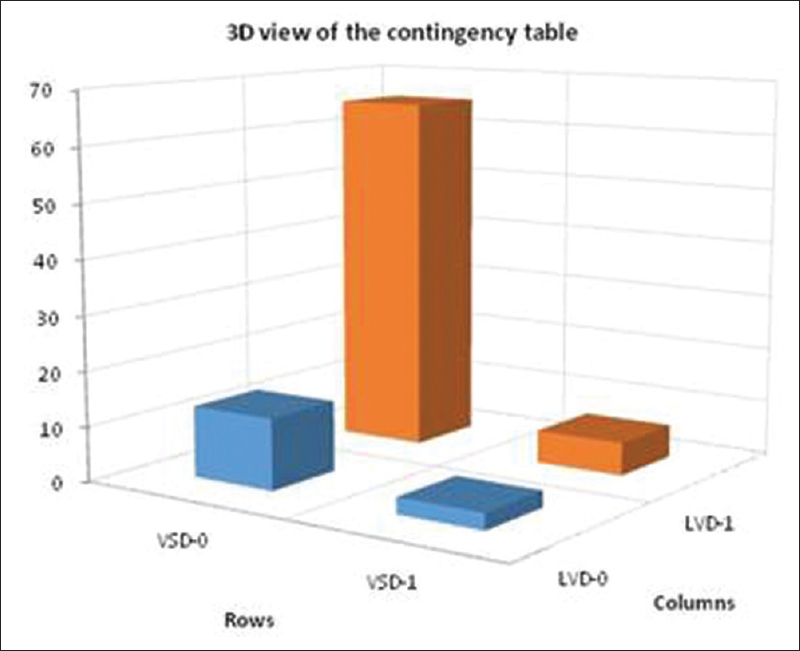 Chi-square test was used on contingency table for statistical analysis. Average follow-up was for 10 months (range: 2 months to 8 years). Eleven patients were lost to follow-up. The mean age of presentation was 30 years. Presentation with failure was seen in 15/87 (17%). Five patients had preoperative LV dysfunction and one had RV dysfunction. Fifty-two patients had aortic regurgitation (AR), of which fifteen were moderate to severe, five of them required valve replacement, and others underwent repair. Fifty patients had VSD who underwent closure. The data of all patients is shown in [Table 1]. Seventeen patients had postoperative LV dysfunction, of which four had preoperative HF, eight had preoperative VSD, ten had preoperative AR, and seven patients had both VSD and AR [Table 2]. Aortic valve replacement was done for one patient and others underwent a repair. ICU stay was prolonged in six patients with three of them having preoperative LV dysfunction and other three did not. ICU stay was prolonged due to complications such as sternal wound dehiscence, arrhythmias, residual RSOV shunt, and severe AR postoperatively requiring replacement. Of the 17 patients with postoperative LV dysfunction, only two patients continued to have severe LV dysfunction on follow-up. Two patients were lost to follow-up. Average follow-up was for 10.3 months (range: 2 months to 8 years). Long-term complications such as moderate to severe AR and severe LV dysfunction were noted in two patients, incisional scar in one, and depressive disorder in one patient. Four patients had small residual shunts at the ruptured site and two patients had tiny residual VSD. No mortality was seen in our study. Statistical analysis was done to see if the coexisting lesions and the preoperative HF were associated with postoperative LV dysfunction. 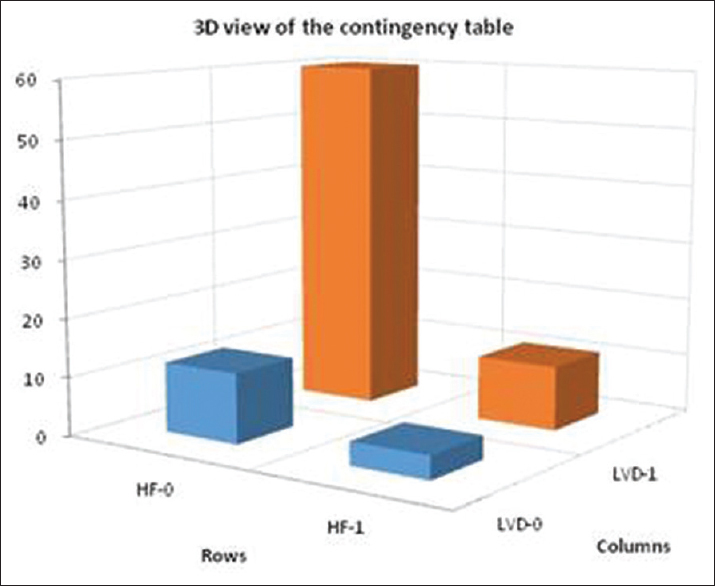 Chi-square test was used on contingency table; there was no statistically significant correlation between coexisting lesions, preoperative HF, and postoperative LV dysfunction [Figure 1], [Figure 2], [Figure 3]. Clinical presentation ranges from infancy to seventh decade; it is usually within the third decade of life. In Azakie et al. 's series, patients ranged from 7 to 57 years of age. In our review, the mean age of presentation was 30 years (range: 10–55 years). The lesion is five times more common in Asians. Various reports indicate a male preponderance in Asians;, similarly, in our study, 64% were males. The right coronary sinus is most commonly affected, followed by the noncoronary sinus. Rupture of the aneurysm most commonly occurs into the right ventricle followed by the right atrium. The most common site of rupture in our study was into right ventricular outflow tract (68%); the rest ruptured into right atrium. Patients are symptomatic with dyspnea, pain, palpitations, or fatigue on presentation in 80% to 85% of the cases. Acute presentation with HF was seen in 17 of 87 patients in the present study. Associated lesions are common in patients with congenital, RSOV aneurysm. AR occurred in 25% of patients, and VSDs in 54% of patients in a study by Murashita et al. In our study, fifty-two patients (59%) had AR, of which fifteen were moderate to severe, five of them (9%) required valve replacement, and others underwent repair in our study. 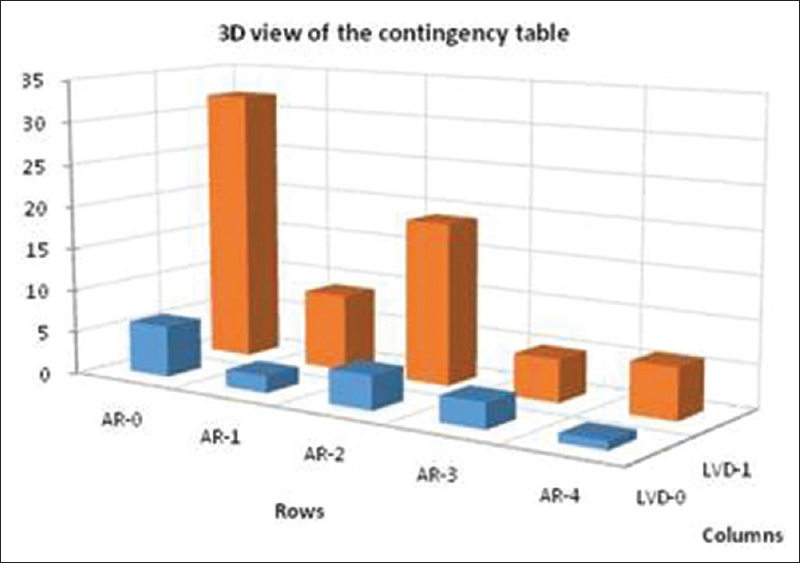 However, most published reports indicate that the AV requires replacement in 20%–30%., Studies have shown that AR has an important influence on cardiac function postoperatively. Cardiac function decreases because of worsening AR. In our study, worsening of aortic incompetence was seen in only two patients and only one of them had low EF. Most of our patients had follow-up up to 1 yr, so no analysis could be done. VSDs are more common in the Asian population with 52% incidence; similarly, our study also showed an incidence of about 50%. The origin and ruptured points of SVA are affected by the presence or absence of VSD. It also affects aortic valve and hence modifies therapeutic management. Patients with untreated ruptured aneurysms of the sinus of Valsalva die within 1 year. Congestive HF is known to be the main cause of death. Hence, the presence of left-to-right shunt caused by ruptured aneurysms of the sinus of Valsalva is an indication for surgical intervention. SVA associated with VSD or with VSD and AR and unruptured SVAs that are producing hemodynamic derangements and enlarging should be repaired. The presence of congestive HF suggests a large shunt and warrants urgent operation. The presence of VSD, AR, or both adds to the volume overload caused by the rupture of SVA. Although the presence of preexisting VSD may reduce the symptoms of acute rupture, postoperative LV dysfunction is anticipated with significant volume load either due to acute rupture leading to HF or the presence of coexisting lesions. Hence, statistical analysis was done to see if patients with HF and with coexisting VSD or AR had postoperative LV dysfunction. The postoperative outcome was not different in RSOV patients presenting with or with out heart failure in our study. Statistical analysis for correlation of preoperative heart failure and postoperative left ventricular dysfunction was not significant. The post operative complications and ICU stay were also not clinically significant which suggest good outcomes with RSOV repair presenting with heart failure. There was no correlation with preoperative VSD and postoperative LV dysfunction. Assessment of postoperative LV dysfunction occurring due to AR needs a good long-term follow-up while our study has only mean duration of 1 year. Most patients survive the early period after operation. Mortality is <5% in largest reported series. Similarly, outcome was good and there was no mortality in our study. RSOV repair outcomes are good with patients presenting with HF or having AR or VSDs; hence, all patients need to undergo the surgical repair and have better quality of life. Lakoumentas JA, Bonou MS, Brili S, Theocharis CS, Benroubis AD, Perpinia AS, et al. Ruptured aneurysm of the right sinus of Valsalva into the right ventricle. Hell J Cardiol 2002;43:242-5. Post MC, Braam RL, Groenemeijer BE, Nicastia D, Rensing BJ, Schepens MA, et al. Rupture of right coronary sinus of Valsalva aneurysm into right ventricle. Neth Heart J 2010;18:209-11. Malik A, Babar TS, Khalil IK, Shah MA, Laiq N. Surgical repair of ruptured sinus of Valsalva aneurysm: Experience at cardiovascular department, lady reading hospital, Peshawar. Khyber Med Univ J 2014;6:116-20. Wang ZJ, Zou CW, Li DC, Li HX, Wang AB, Yuan GD, et al. Surgical repair of sinus of Valsalva aneurysm in Asian patients. Ann Thorac Surg 2007;84:156-60. Yan F, Huo Q, Qiao J, Murat V, Ma SF. Surgery for sinus of Valsalva aneurysm: 27-year experience with 100 patients. Asian Cardiovasc Thorac Ann 2008;16:361-5. Moustafa S, Mookadam F, Cooper L, Adam G, Zehr K, Stulak J, et al. Sinus of Valsalva aneurysms–47 years of a single center experience and systematic overview of published reports. Am J Cardiol 2007;99:1159-64. Murashita T, Kubota T, Kamikubo Y, Shiiya N, Yasuda K. Long-term results of aortic valve regurgitation after repair of ruptured sinus of Valsalva aneurysm. Ann Thorac Surg 2002;73:1466-71. Azakie A, David TE, Peniston CM, Rao V, Williams WG. Ruptured sinus of Valsalva aneurysm: Early recurrence and fate of the aortic valve. Ann Thorac Surg 2000;70:1466-70. Jin Y, Han XM, Wang HS, Wang ZW, Fang MH, Yu Y, et al. Coexisting ventricular septal defect affects the features of ruptured sinus of Valsalva aneurysms. Saudi Med J 2017;38:257-61. Kirklin JW, Barratt-Boyes BG, editors. Congenital aneurysm of the sinus of Valsalva. In: Cardiac Surgery. 4th ed. New York: Churchill Livingstone; 2013. p. 1326-41.